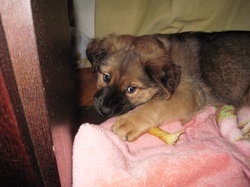 Sophie (mom): Sophie was found wondering in Korea Town scared and hungry. She was frantically pacing a corner of a street like she didn't know what to do. Maybe someone dumped her? ( Some people do this when they find out their dog is pregnant.) Or did she get out because she was in heat and got lost? Hard to tell how long she had lived on the streets. Amazing that she survived! She had no tags or collar and took over an hour to catch. She's very smart and fast. When she got to the foster home, she had a bath, food, and she slept. House broken. The next day she visited the vet and he palpated her and concluded she had already given birth. Well, even good vets can make a mistake. 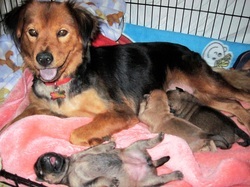 She gave birth to 5 puppies 2 weeks later in the foster home where she was able to take very good care of her puppies. She is a great mommy! It's so much fun to watch her play with her puppies. Sophie is the sweetest dog and submissive when she trusts you. She is so submissive and listens well to the foster mom. She will be easy to train as she is very smart and wants to please so much. She is very protective of her puppies and her home. Even though she's small (35 lbs) she's a great guard dog and not afraid to show it when strangers come around. Charlie - 4 1/2 months old. 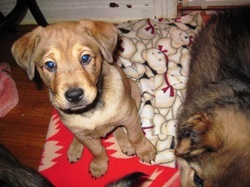 (tan puppy): Charlie was born the biggest puppy and still is the biggest puppy. He will be 50-60 lbs fully grown. He is a big sweetie pie, loves to snuggle and wrestle with his sister. He's a goofy, handsome, go anywhere, do anything kinda guy. He's also a good sport and let's his sister boss him around. Would make a fun family dog or a cool companion. Almost house broken and will snore when very tired. Pepper- 4 1/2 months old: A sassy little girl and very affectionate. She may be a little shy at first and likes to observe. But once she feels like you're ok, she'll give you lots of kisses and wants to play. She's a darling, sweetie pie with a little bit of a clown mixed in. She might be part kitty because she likes to pounce! Adorable. She will be mid-size. 35-45 lbs fully grown. Almost housebroken. They all love to snuggle in bed and sleep with their human.